A rosacea skin condition can be difficult to identify especially in its early stages. A facial irritation can resemble acne or simply a flush or burn. Identifying the disease is very important for successful control and treatment. To help treat and control this inflammatory disease it’s best to begin with identifying the condition. Many people are unfamiliar with rosacea symptoms and do not recognize it in its early stages because it can share a number of characteristics of other similar conditions. It can be mistaken for acne types, lupus, psoriasis, eczema, or skin types that have broken or dilated capillaries (Couperose). 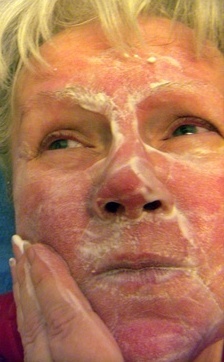 Early diagnosis and a dermatologists suggested treatments is the key to successful control of this facial skin disorder. The beginning rosacea signs are different for each individual. It may begin as “blushing” or cause redness to the face, nose, cheeks, and forehead. It may come and go and show similar signs of acne and acne- prone skin. Sometimes burning, itching, and eye sensitivity may accompany some cases. This disorder may progress to a more persistent redness, become more intense, have facial swelling that may affect the eye area, and visible broken blood vessels may appear. Left untreated, rosacea usually advances into more serious problems. It can lead to disfigurement that often occurs mainly on the nose, where the skin will thicken, swell, develop excess tissue/ enlarged pores and cause a red, swollen appearance (Example-W.C. Fields). This common inflammatory disease is sometimes hard to self-diagnosis and may need the direction of a doctor for success and proper treatment. Triggers are anything that may cause a flare-up to the face making rosacea worse. Triggers can be brought on by the elements such as sun and wind, hot weather, or simply, temperature changes. Avoidance of any known triggers will also help manage rosacea together with medical therapy. Keep a journal of potential triggers and the reaction you had. In combination with a good skin care regimen, cosmetics to camouflage the problem, lifestyle and environmental care, and numerous treatments directed by a physician, this disorder can be controlled. Prescribed medications, topical therapys, oral antibiotics, laser, or other surgical procedures are some methods of treatment. The cause of rosacea is still unknown. It tends to affect adults with fair complexions. Women may be at a higher risk for the disorder although men generally suffer more severe symptoms. It is not life-threatening but it can affect your appearance, cause you embarrassment, social problems, and lower your self-esteem. Usually you don’t out-grow this chronic disorder of flare-ups and remissions that become increasingly worse if left untreated. Rosacea is not curable but it can be managed on a long-term basis successfully. Fortunately, once diagnosed, it’s quite treatable.